with these prices, people are dying to get in – get it? Haha! George Romero’s Dawn of the Dead, the sequel to his 1968 classic Night of the Living Dead , is a near-masterpiece of horror, splatter, comedy, and social commentary. The weaknesses of editing, mediocre acting, and low-budget effects are more than mitigated by the power of its message, the claustrophobia of its setting, and the fleshing out of its characters. For the uninitiated, in Night of the Living Dead, the bodies of the recently dead began rising up to devour the living. Dawn begins in the chaos of a television station, with the ever-growing army of walking dead starting to become a real problem and panicking employees scrambling to keep on the air. A pregnant anchor and her helicopter pilot boyfriend make a getaway during the commotion, eventually hooking up with two police officers also looking to escape from the city. 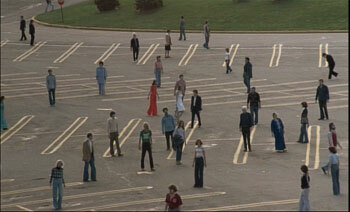 The foursome eventually make it to a large shopping mall, and this is where the rest of the movie takes place. Seeing the mall as a potential fortress, they make a landing and formulate a plan to rid the mall of the current zombie infestation and then secure it from the outside. At first elated wth the thought of “owning” an entire mall populated with all the food and material items one could ever want, they soon become detached, lethargic and bored with their surroundings, that is until a motorcycle gang of surivalists show up to raid the place. The standout performance is by the lead, Ken Foree, who gives his character a hard edge but still keeping him vulnerable. David Emge also plays the babe-in-the-woods survivalist well while also giving a great performance in physical comedy towards the end (I’m trying hard not to give away his character’s fate here). 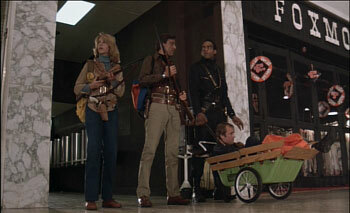 Criticism towards Romero for the “Duh” factor of his obvious broad shots at rampant consumerism mean little – he was never coy about his intentions and in addition, the use of the mall setting was eerily prescient, given that there weren’t too many back in the late seventies. Besides, how can you not acknowledge the brilliance of watching zombies shuffle around a mall in a daze, going up the down escalators and stepping over other fallen zombies while Muzak from the DeWolfe catalogue plays in the background? Romero also makes an important point about the languor that seeps in through the idleness of a material world – towards the end of the film, our heroes are silently losing their minds in their isolation but nobody ever thinks of leaving the mall. Even when the biker gang invades there is no urge to flee, but as demonstrated through the actions of Emge’s character Stephen, the urge to defend the place and all its possessions is overpowering. As Tyler Durden said, the things you own end up owning you. The zombie and cannibal splatter effects are suitably gruesome, if low-budget. Tom Savini shows off his skills here (which would be later perfected in Day of the Dead ). And there is suitable comedy in the indifferrence of the bikers to the zombie menace surrounding them (bikers throwing pies and spraying seltzer water in the faces of confused zombies is funny – while many critics pan this scene as silly and ridiculous, I find it hilarious and realistic – if you were a crazed biker survivalist in a world populated by walking dead people, your priorities would be a bit askew as well). Finally, progressive rock group Goblin gives a memorable score strangely suitable to the action. This movie gave them popularity, especially with Dario Argento, Lucio Fulci (who ripped off the zombie theme), and shlock hack director Bruno Mattei (who ripped off the Dawn music). Meet me at the mall. It’s goin’ down. Why somebody thought it was necessary to remake Dawn is beyond my comprehension, but then again we live in an age where somebody thought it was a wise idea to remake Psycho and The Texas Chainsaw Massacre . 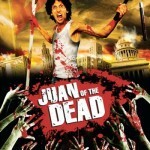 Zack Snyder directs Sarah Polley and Ving Rhames (taking over Ken Foree’s role) along with a band of other survivors and sends them into the same plotline as the original – the dead are returning to life and eating the living, and if you are bitten by a zombie, you’ll become one shortly. They head over to the Crossroads Mall and we get to hear Muzak of Don’t Worry Be Happy , a suitable tune for the end of the world. In the new version, zombies run and are more animalistic than their Romero counterparts – not a trace of lingering memory left (save Rhames’s explantation that they come to the mall out of instinct). This is, ultimately, my problem with this Dawn – everything must be faster, slicker, with little room for any commentary or characterization. Save the brilliant opening 20 minutes (Sarah Polley awakens to a suburbia in chaos showing civilization’s rapid disintegration followed by a clever credit sequence scored to Johnny Cash’s The Man Comes Around ), the movie soon settles into what becomes essentially an action picture in the Aliens mold, where our heroes are barricaded in AnyMall USA, fighting a menace of rampaging monsters outside. There are two other good scenes in the film – the first involves a creepy zombie baby birth and the other deals with a game of “shoot the celebrity” – where our survivalists target a zombie who looks like somebody famous – but these moments only serve to keep the movie from drowning in its apathy towards any true comprehension of the meaning of Armageddon. The film would rather wallow in action movie formula, so it is on this level I must ultimately judge the film. The problem is that instead of stealing the flavor of an action scene from Aliens or even the original Dawn, it chooses to steal from 28 Days Later instead, which is a miscalculation. The use of digital fast-speed photography makes the action sequences dizzying and confusing – it is hard to tell what is going on at any particular moment because there is a lack of clarity in the frame. The ending credits of the film roll over a homage to The Blair Witch Project , cementing the piece as another cash-in project using our nostalgia for 70s horror as the bait. This remake has its moments, for sure, but if only the creators gave a little more effort in subtext, were a little less squeamish in use of gore (except for one decent chainsaw sequence), and a little more interested in characterization I might have given it more slack. If anything, 2004’s Dawn proves that Romero’s nightmare of ultra-consumption has come to fruition, that it’s the shopping mall mentality that has taken over the world, that art has been consumed and regurgitated, and that without realizing it we have all become zombies.